The Government of India’s latest inter-state comparison may have humbled Gujarat to No 3 position in ease of doing business, from the No 1 it enjoyed a year ago. However, what should be even more disconcerting to state policy makers is, of the 10 reform categories examined for ease of doing business, Gujarat ranks No 1 just in one. Equally, the assessment, carried out by the Department of Industrial Policy and Promotion (DIPP), Government of India, in partnership with the World Bank, finds that of the 10 categories examined, Gujarat ranks in the first five positions in just two reform categories –access to land and in commercial disputes resolution enablers. Thus, in access to land category, the assessment, which is based on the implemented DIPP’s Business Reform Action Plan (BRAP) for states/union territories in 2015-16, covering the period July 1, 2015 to June 30, 2016, Gujarat is No 1 in availability of land, and No 2 in commercial disputes resolution enablers. In the other eight categories assessed for ease of doing business – access to information and transparency, single window systems, online tax return filing, construction permit enablers, environmental registration enablers, inspection reform enablers, labour regulation enablers, and obtaining electricity connection – Gujarat fails to figure even in the top five. The assessment, put on the DIPP portal, does not say what is reason for Gujarat failing to perform on the neo-liberal agenda, which Prime Minister Narendra Modi had sought to project as a model for other states to follow. Ironically, it is Congress-ruled Uttarakhand which finds its place No 1 position in three of the 10 categories (information and transparency enablers, inspection reform enablers, and obtaining electricity connection).More, Uttarakhand is the first five in five other reform categories. Thus, it is No 2 in three other reform categories – labour regulation enablers, online tax return filing, and single window. Further, it ranks No 5 in availability of land, No 4 in environmental registration enablers. Yet, strangely, Uttarakhand does not find its place above Andhra Pradesh, Telangana and Gujarat, ranking No 1, 2 and 3, respectively in overall performance. The case of BJP-ruled Haryana is equally baffling. The state ranks No 1 in four of the 10 reform categories – construction permit enablers, labour regulation enablers, online tax return filing, and single window. More, it ranks No 4 in availability of land, and No 3 in environmental registration enablers. 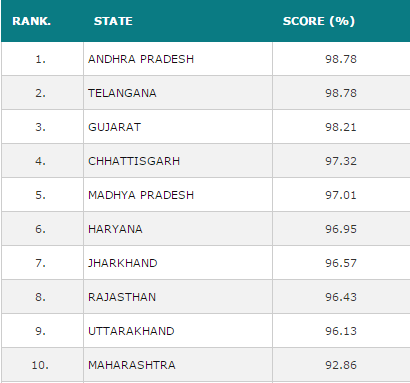 Yet, in overall performance, it ranks worse that the first three states!